A quick note: Thanks to NPR's First Listen site, you can now stream for free (but only for a limited time) The Best Of Fare Thee Well: Celebrating 50 Years Of The Grateful Dead. This new double record, featuring 16 tracks recorded during the Dead's farewell shows in Chicago this summer, will be officially released on November 20th. But you can get a sneak peek right here, right now by clicking the play button on the audio player below. Tracks includes "Box Of Rain," "Shakedown Street," "Truckin'," "Scarlet Begonias," "Fire On The Mountain," "Not Fade Away," "Touch of Grey" and other fan favorites. 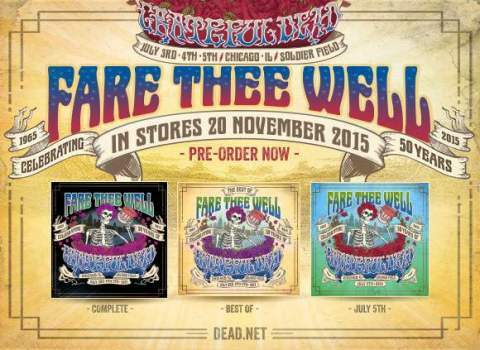 As with all Dead shows, you can also find raw recordings of the entire three Chicago concerts on the web. Just revisit our July 7th post to stream those too.